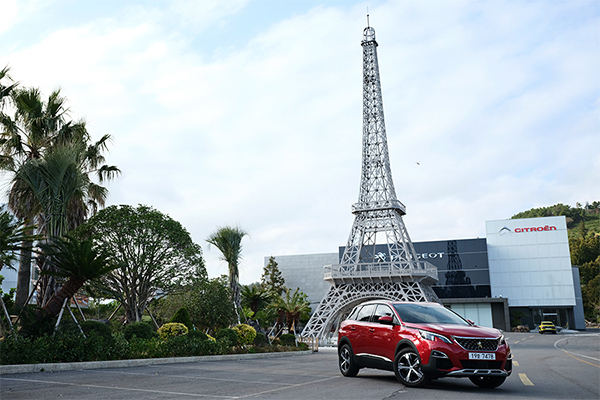 Hanbul Motors Corp., Korean distributor of French carmaker Peugeot Citroen Automobiles SA, opened Peugeot-Citroen museum in Korea’s southern resort island of Jeju, the first overseas automobile museum of the French brand. According to Hanbul Motors on Thursday, the two-story museum with one underground floor that has a 33-meter-high Eiffel Tower replica has been set up to introduce the brand’s history to visitors. It has an experience zone named Citroen Origins and souvenir store Heritage Store on the first floor. On the second floor, the automaker’s classic car models including Peugeot Type 139 A torpedo (1911), 153 BR torpedo (1923), 201 C sedan (1930), 401 D limousine (1935) and 601 sedan (1934) are displayed, along with 17 vehicles manufactured from the 1970s to 2006. Hanbul Motors has so far invested about 11 billion won ($9.8 million) in the museum. It bought some of the cars and borrowed 32 vehicles from PSA Group. Out of the 32 cars, only seven are exhibited in the museum as of now, with the rest scheduled to be shipped to the country from next year. Emmanuel Delay, head of India-Pacific region of PSA Group, said during the opening ceremony that it is meaningful that Paugeot-Citroen opened its first overseas museum other than France in Korea, adding that he hoped the museum would make a contribution to Korea’s automobile industry development.